Tagline- They’ve Attacked His Family. They’ve Killed His Partner. They’ve Made the Wrong Guy Very, Very Angry. Released in 1990 Marked for Death was the 3rd film starring Steven Seagal who broke onto the scene in 1988 with Above the Law and followed that up with Hard to Kill, which like this film was also released in 1990. With Marked for Death, Seagal had another hit film and was one of the most bankable action stars. When it comes to Seagal I personally find him a bit underrated as an actor. While he isn’t an Oscar caliber actor he did play the no nonsense tough guy role very well and the most criticism he gets is that he more or less plays the same character each time out, which to some degree is true, but Clint Eastwood who is a great actor and one of my film idols made a whole career playing the tough guy role regardless of genre. Steven Seagal was paid to be the tough guy and he plays the role well. 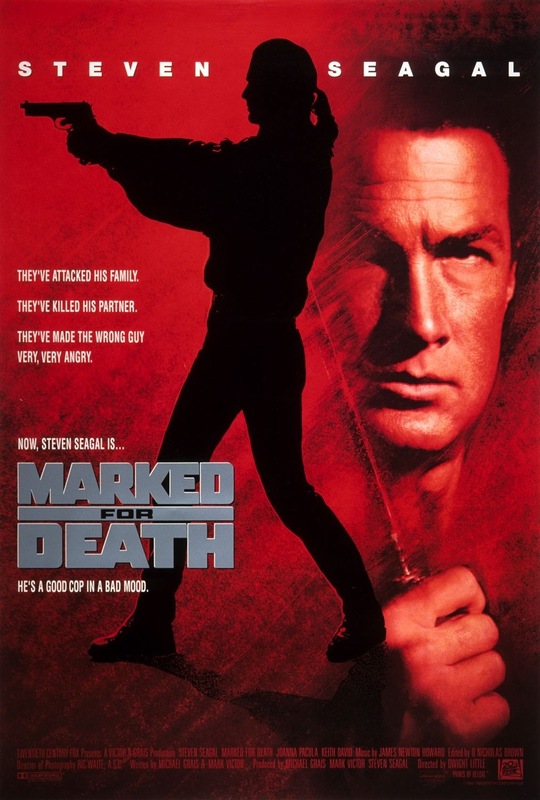 When it comes to Marked for Death I don’t remember when I first saw it, if not in cinemas than when it was first released on video and while the film is still enjoyable it isn’t quite as awesome as it was back in 1990. After his partner is killed during an undercover mission John Hatcher (Seagal) who works for the DEA leaves and returns to his hometown only to find it overrun with a Jamaican posse dealing drugs. After crossing paths with them the posse attacks Hatcher’s family, which ends up being a big mistake. The screenplay was written by Michael Grais & Mark Victor and the two also the Charles Bronson film Death Hunt as well as the first two Poltergeist films. The script is your standard action film of the time and is even a bit cliched. Films such as Death Wish 4 had a similar theme with the drugs aspect. The characters lack depth and the plot is a bit lacking, but in the action genre you can get away with that, which to some degree the film does. The final act gets a bit silly with the main villain and does add a bit of camp value even if that wasn’t the intention. Overall the script while not poor wasn’t all that strong either, but is fair enough for an action film. Director Dwight H. Little got his big break directing Halloween 4 in 1988, which starred Danielle Harris who has a bit part here. By many Halloween 4 is seen as the best sequel of the series and while I disagree it was a fairly decent film. After that Little made such films as Rapid Fire and Murder at 1600, but since his film Anacondas: Hunt for the Blood Orchid hrs mainly been a TV director with such credits as 24, Bones and Prison Break. From a technical side, Dwight Little crafts a decently made film, but there are some pacing issues in spots and at times the film can be a little over dramatic. Action sequences are staged fairly well, but I’m not sure Dwight Little was the ideal choice for a film like this, but he would fair much better with Rapid Fire. Overall Dwight Little does deliver a fun film, but it just quite hasn’t held up over the years even if still enjoyable. Marked for Death does make for an entertaining film even if not as awesome as it used to be. 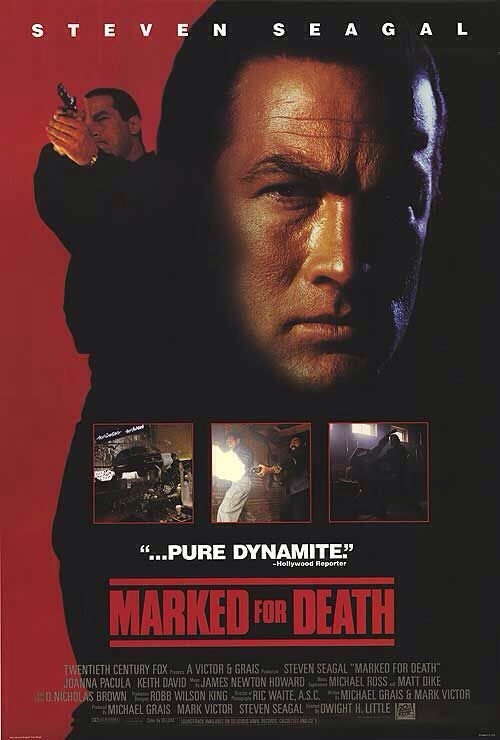 By many Marked for Death is seen as Seagal’s best film and at one point I would agree, but as mentioned it hasn’t held up as well for me and while I wouldn’t rate it as Seagal’s best it would be in my top 5.